We are all aware of the subtle and progressive changes that occur as we age. The skin starts to lose its elasticity, the fatty pockets in the face begin to atrophy and the supporting ligaments which hold the fat pads in place begin to stretch, bulge and descend. Beneath all this there are boney changes taking place as well. 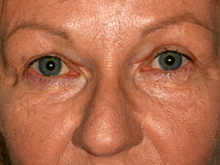 The effects of these eyelid changes is to form bags, which occur at the ligamentous demarcation lines around the eyes. 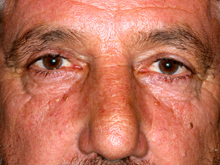 In the upper lids these changes may create excess redundant skin (dermatochalasis), the fat pockets may prolapse and become visible, or to the eyelids may descend (ptosis) – sometimes all three. Additionally there may be some descent of the eyebrows. 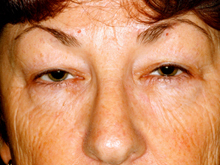 In the lower lids the fat may bulge forward, either in combination with excess skin, or in isolation. Additionally, these effects can be exacerbated by the descent of the fat pads in the middle of the face. 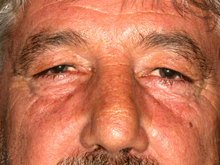 Some of these changes can be addressed by “SOOF” (Sub Orbicularis Oculi Fat) lifting surgery, in combination with blepharoplasty. Different types of surgery can be used to address many of these issues either singly or in combination. I will be happy to assess these issues and their management. 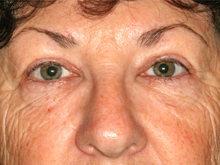 Generally the best value in terms of results can be achieved with upper lid blepharoplasty. 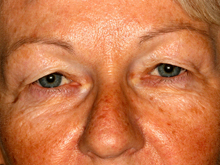 The skin furrows and crows feet that may occur are dealt with under the heading BOTOX®. 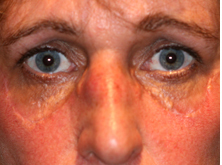 Pre and 6 weeks post bilateral upper lid blepharoplasty and ptosis procedure. 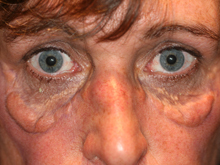 This lady had malar bags associated with Xanthelasma (lipid deposits in the skin). She has an excellent result following excision.